Sad news from Lumberton, where I’ve learned that just a few months after opening, Nelson’s Barbecue has shut its doors. Owner Andy Price apparently overextended himself financially and, despite a beautiful restaurant space and a true passion for traditional wood-cooked barbecue, Nelson’s is no more. No word yet on what will happen to the property or equipment. I’ll check with Andy and see if he’d like to share anymore on this site. I was impressed by Andy and his family, and am very sad to see their dream fade away so quickly. Here’s to hoping an angel investor will swoop in and help Andy out. 1) The venerable Durham institution Fishmonger’s, in business for nearly 30 years as a seafood market and restaurant, added barbecue to the menu a few years back. 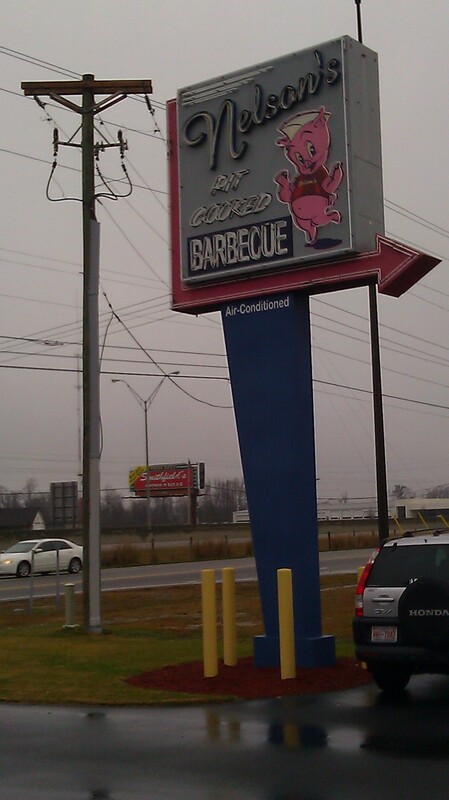 I’d noticed the neon “BBQ” sign in the window a couple of times but never thought much of it. As a restaurant known for oysters, shrimp, and other fresh caught seafood, I assumed their barbecue was store bought or from another restaurant. Well, it turns out that Fishmonger’s founder and owner is a transplanted Texan from the Houston area, and he loves barbecue almost as much as he loves seafood. He added his own gas-fired, wood chip burning smoker a few years back and turns out a wide assortment of barbecue, from Carolina-inspired pork barbecue with vinegar sauce to Texas standbys like brisket, sausage and ribs. Their full BBQ menu is shown here. I doubt they’re going to change their name to Porkmonger’s anytime soon but they seem eager to have more folks sample their ‘cue. 2) Food writer Greg Cox of The News & Observer reviewed Charlie’s BBQ & Grille in Clayton in a January 6th article. Cox’s very positive, three-star review notes that Charlie’s is a place where, “Purists might turn up their noses at such an ecumenical approach to barbecue–not to mention that [owner Charlie] Carden uses an electric cooker to coax the smoke from chunks of seasoned hickory.” Ecumenical? Charlie’s menu includes brisket, Eastern, Lexington-style and even sweet Western North Carolina pork; chicken; ribs; and sausage. Ecumenical indeed, and that always raises a red flag for me unless I’m in Kansas City or Texas. However, it is encouraging that Cox’s article mentions the inspirational stint Carden worked at the rightly revered Allen & Son in Chapel Hill; Carden is clear that he never had any intention of setting out to duplicate Allen’s laser-like focus on vinegar-spiked chopped ‘cue. 3) Finally, the restaurant I am most excited to try: Nelson’s Barbecue in Lumberton, which opened just after Christmas (actually, on the 8th night of Hanukkah, I believe). I’ll be sampling Nelson’s soon so will save the presumably juicy details for then, but I am encouraged that the owner, Andy Price, has decided to cook over a traditional wood-burning pit. From what I’ve heard about Price from reliable sources, the guy cares deeply about NC barbecue traditions and knows what he is doing. I have a sneaking suspicion that Nelson’s is going to be a must visit place for barbecue enthusiasts. We shall see.